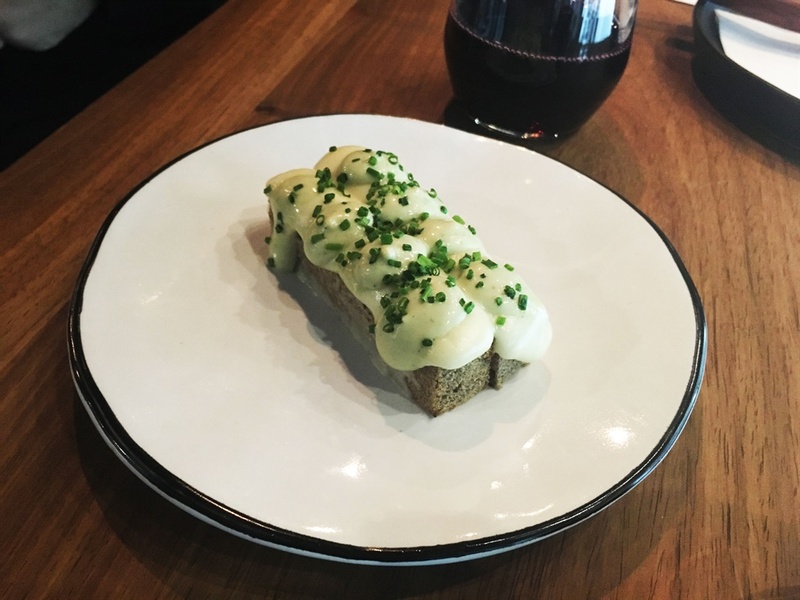 Two of the hottest new Cape Town restaurants opened around the same time last month emitting one of the biggest food buzzes witnessed in Cape Town. I arrived back from overseas and headed straight to Ash on a Monday and then The Shortmarket Club on Thursday. Ash opened rather sneakily adding to Ash’s cool repertoire and no fuss approach. SMC was set to open on the 28th June but had a series of soft launches before the official booking date. Lately it’s hard to keep up with rapidly growing ecosystem of restaurants however these two aren’t ones you can miss. 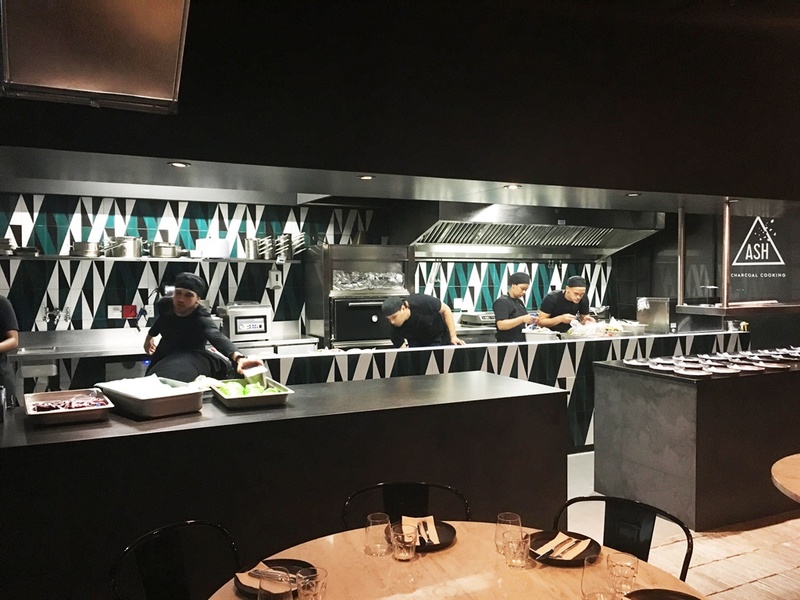 After interviewing both Ash and Wesley, it was clear that their restaurants would be entirely different, Wesley offering a twist on classic fine-dining and Ash offering a total collapse of fine-dining and entering a new style of cuisine for Cape Town. At Ash, myself and partner sat at the comfortable bar chairs at a counter facing the hanging room. The view of the hanging room isn't for everyone so if you are a two or three seater, ask where you’ll be seated. 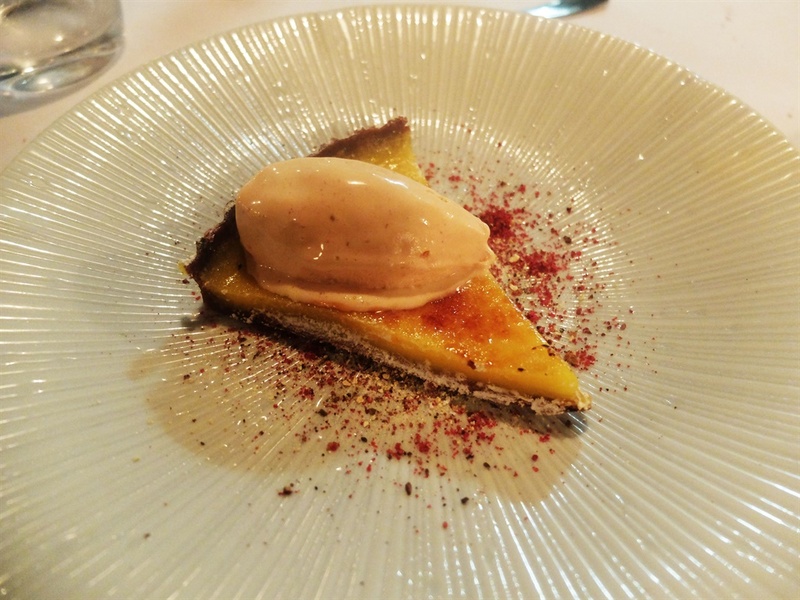 We got to taste a great variety of dishes at Ash: two starters, two mains and two desserts. The menu is fairly large with the main section divided into cold and hot dishes and a very substantial selection of desserts. Ash seems to have taken all her previous experience and amalgamated it into this menu. You’ll taste her time in London, her South African heritage, as well as a hint of New American cuisine. 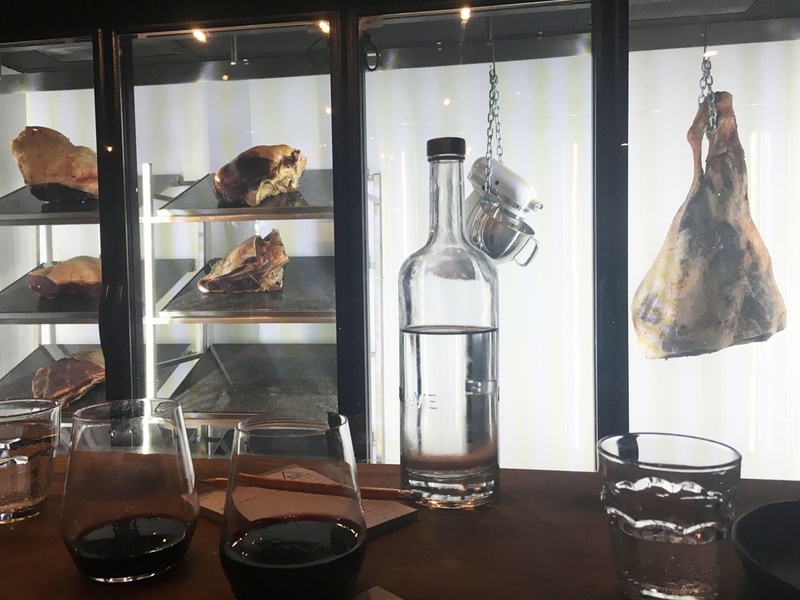 Of course there is the obvious Frankie Fenner-ness shown by the variety of quality meat options and Publik wine still reigning as the provider of independent wines. 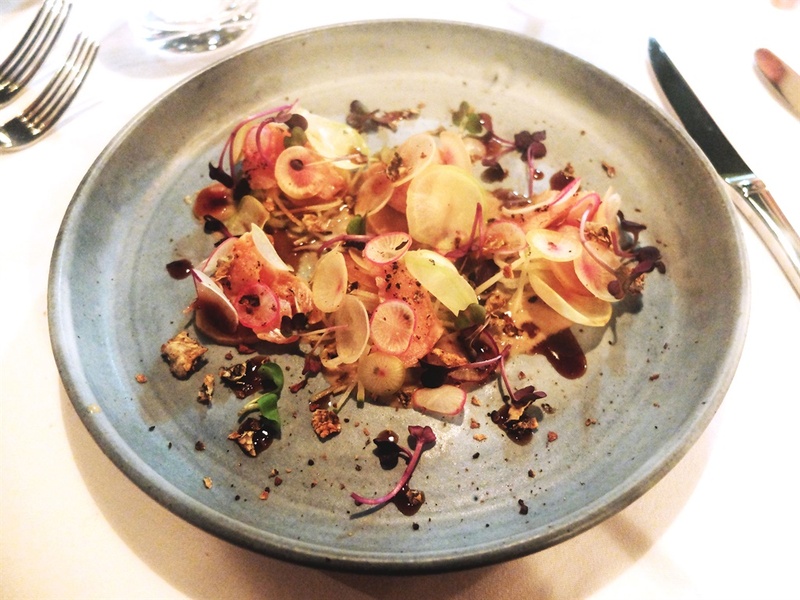 The most prominent dishes for me were the Pig Head Scrumpet, beetroot and fennel salad and the cheese on toast. The Dry aged beef would’ve made the cut had the gravy been brought with it. It somehow got lost on the way, making the steak just a bit short of perfection, but the quality and tenderness of the meat was undeniable. The scrumpet was served with an apple, hanepoot and Szechuan puree and was your ideal salty-sweet dish. The shredded pork coated in a light breadcrumb batter was like a contemporary version of the perfect Sunday Roast. 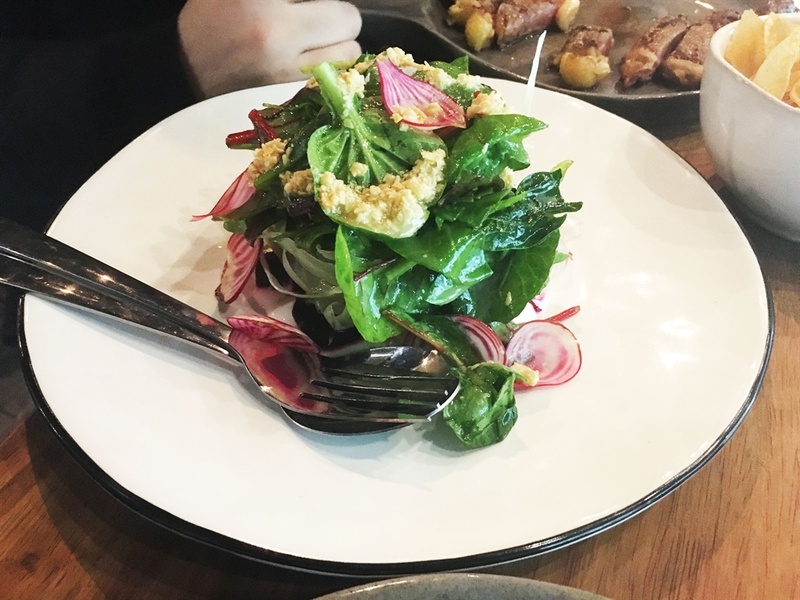 The salad, like all of Ash’s dishes was a simple concoction of flavours but so enjoyable. Ash manages to use only a few ingredients, but treat them in such a way that gives the dish a variety of favours. In the salad it was the pickled and cooked beetroot with the almond praline and tangy house dressing that made it so tasty. On the dessert front, the lemon meringue pie was the sweet success. It might be a little too sweet for some but its ideal for sharing. The lemon and crumble base is literally smothered in meringue – a sweet tooth’s dream. See the full gallery of Ash here. Heading over to SMC, although very different to Ash’s sleek basement restaurant, there is one thing similar between the two: they both go back to the traditional three-course style of eating. In fact a pleased friend remarked on this at the table, happy to know that the dish she ordered would actually be her dish. It makes a nice change from eating tapas and sharing little portions of food, because sometimes you just want a plate to yourself. The defining feature about SMC, aside from specific dishes, is the space itself. You really are transported somewhere else and to put it simply you just feel good, sitting there in one of the circular elevated booths, allowing you to enjoy the view of the room. Just like the breakfast, food is served off trays and trollies, a feature you're unlikely to find much elsewhere. For starters, trout tataki with teriyaki braised sweet potato, ginger tahini and thinly chopped bits of granny smith apples, was lovely and light and the sweet-sour fruitiness of the apples cut into the salty Asian flavours perfectly. The other starter highlight was the crispy battered octopus with mango Atchar, sesame tamarind dressing and bonito flakes. A tender deep fried octopus? You can’t really go wrong, but the bonito flakes totally elevated the dish as well as the sweet, tangy Atchar. For main’s I had the pea and porchetta, which was utterly superb. 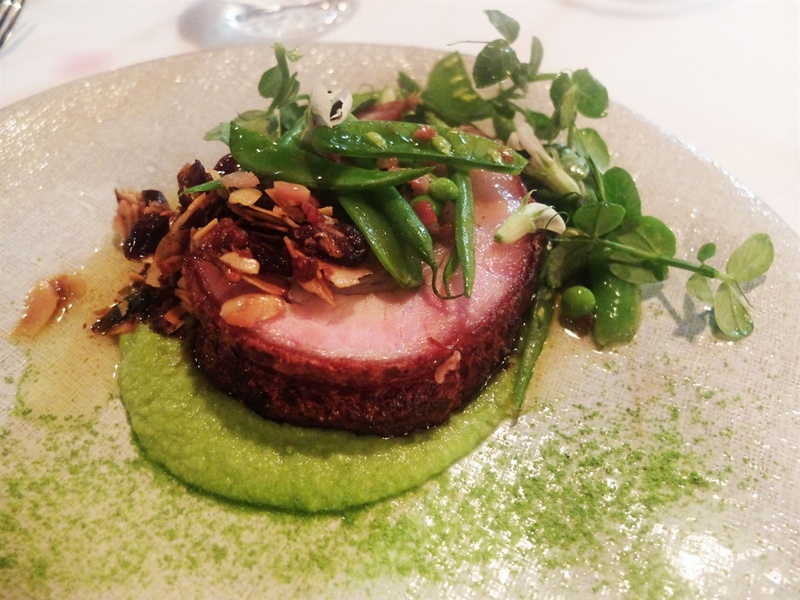 The fresh peas, sugar snaps and pea shoots made the plate bright green and gave the rich pork dish a freshness and crunchy texture. This was also contrasted with the creamy horseradish amasi beneath the porchetta. The dish for me was pretty exceptional and undoubtedly the best pork I’ve had. Unfortunately one of the diners at our table received under cooked chicken which tampered with the general positive flow of the mains. 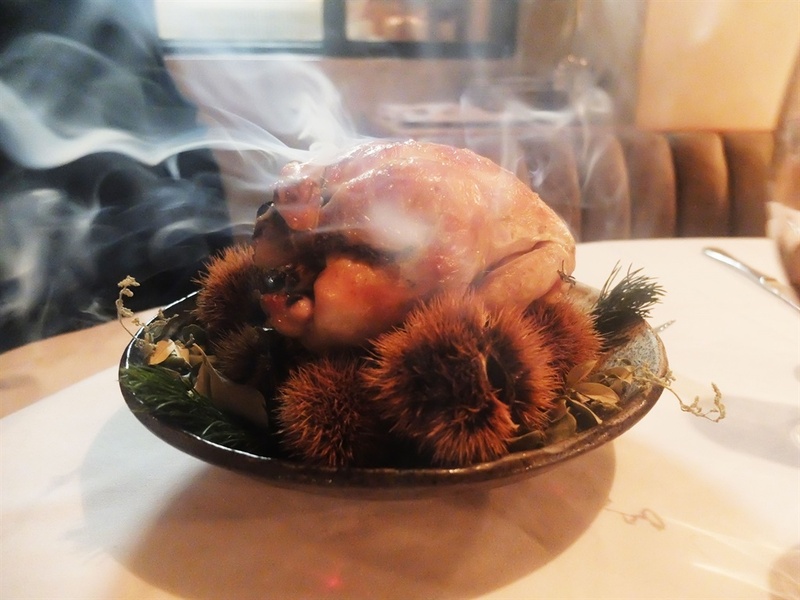 The chicken is seemingly the signature dish of SMC, Chestnut and fynbos roasted Petit Poussin, and its certainly the spectacle of the dinner experience, brought to the table just before plating while silky smoke glides off the bird. The smokey chestnut flavor was praised, so hopefully the mishap was one that will be rectified in chickens to come. Dessert saw the lemon tart for me which was sensationally zesty and smooth, and you know it’s good when Liam Tomlin names it the best lemon tart outside of London. See the full Shortmarket Club gallery here. Both restaurants definitely deserve a visit and returns. Ash will most likely become a regular spot for people after a decent steak or a simple relaxed dinner in an effortlessly cool environment. SMC is a more pricy and upmarket affair so make sure you book in advance to secure a table as I imagine it will host many special occasion dinners. Otherwise enjoy a drink by the bar with oysters as you wait for a table to become available. Follow Food24 on Instagram, Facebook and Twitter and show us your pics using the hashtag #Food24_sa.